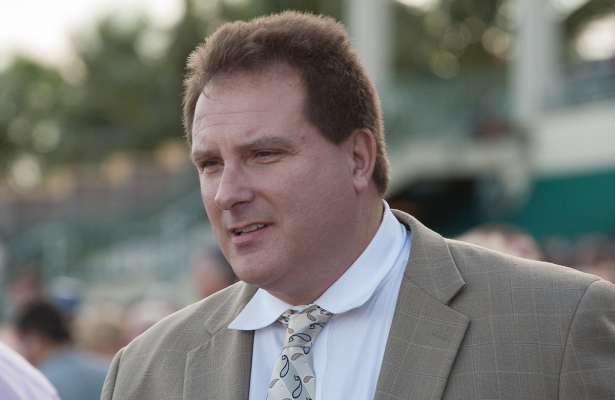 Trainer Mike Maker will saddle the talented trio of Go Noni Go, Rahway and Beach Waltz in Saturday’s 14th renewal of the $100,000 Hatoof Stakes, a 1 1/16-mile turf route for sophomore fillies at Arlington International Racecourse. Go Noni Go, a three-time winner from 11 career starts for owner Three Diamonds Farm, leads the 12-horse field with $182,006 in purse earnings. The dark bay daughter of Get Stormy made the grade with a score in the one-mile Grade III Bourbonette Oaks on St. Patrick’s Day at Turfway Park. Following a fading fifth effort in the Grade III Selene Stakes on the Woodbine Tapeta, Go Noni Go was an unlucky second last time out when collared late by Beyond Blame after setting the pace in the Grade III Regret Stakes over 1 1/16-miles of firm Churchill Downs turf. Leading rider Jose Valdivia, Jr. will guide Go Noni Go from post two. Rahway, by Eskendereya, is out of the graded stakes winning dam Freedom Star who took the 2010 running of the Grade III Azeri Stakes at Oaklawn Park. With two wins from seven career starts for owner Out Of This World Racing LLC, Rahway demonstrated impressive stamina with a prominent 2¼-length score in a $50,000 starter allowance on April 21 over 1 1/8-miles on the Keeneland lawn. The bay, to be ushered out of post eight by Jose Lezcano, arrives at the Hatoof from a pacesetting fourth in a nine-furlong turf allowance at Churchill Downs. Beach Waltz, a homebred daughter of Treasure Beach racing for Kenneth L. and Sarah K. Ramsey, is seeking class relief following off-the-board efforts in the Grade III Edgewood (10th) and Grade II Appalachian (5th) at Churchill Downs and Keeneland respectively. Out of Kitten’s Dancer, Beach Waltz, who won the grassy Mrs. Presidentress Stakes at Gulfstream Park on Feb. 17, is from the same family as multiple graded stakes winner Bigger Picture. Corey Lanerie will ride from the outside post. Trainer Chris Block, who recently tied Hall of Fame trainer Harry Trotsek for most stakes wins at Arlington with 44, will send out 2017 Arlington-Washington Lassie Stakes winner Bet She Wins from post four. The daughter of First Samurai exited her stakes score to finish sixth in the Grade I Darley Alcibiades at Keeneland. She opened her 2018 campaign with a troubled seventh in the Bourbonette Oaks, won by aforementioned Go Noni Go, and has since landed third and fourth in off-the-turf optional claiming allowance events at Arlington. Jose Lopez retains the mount. Cool Beans (Florent Geroux, post one), Drinks On Me (Edgar Perez, post three), Colonia (FR) (Joe Bravo, post five), Cheeky Cherub (Declan Cannon, post six), Bridaled Temper (Brian Hernandez, Jr., post seven), Hayworth (Carlos Marquez, Jr., post nine), Mountain Momma (Chris Emigh, post ten) and Madam Milan (Feargal Lynch, post 11) complete the field. The Hatoof Stakes is slated as Race 7 (4:51 p.m.) on Saturday’s 10-race card.